"Love Is Strange," directed by Ira Sachs, and co-written by Sachs and Mauricio Zacharias, has the confidence in its beautiful and emotional story to tell it simply. It's about many things: growing old, New York real estate, family, work, friendships...but what it is really about is love. Love is not strange at all. It is what we do, if we are lucky. 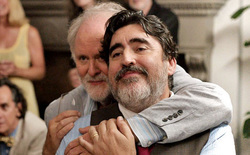 After 39 years together, Ben (John Lithgow) and George (Alfred Molina) get married. Ben, a painter, is anxious, and struggles with sadness at every moment. George, a music teacher, is there to pep-talk Ben, keep him focused, look on the bright side. We see all that in their behavior as they try to hail a cab in Greenwich Village to get to their own wedding. The behavior between these two actors immediately lets us know who these guys are, and who they are to each other. When they say their vows, the happiness in the small group of friends and family gathered is palpable. But very soon afterwards, George loses his job as a choir director at a Catholic school (because, with the wedding, he has officially come out). The priest (a wonderful John Cullum) considers George his friend, but the Archdiocese has demanded George be let go, and he can't say no to his bosses. With the loss of income, Ben and George have to sell their co-op and and crash on people's couches as they look for new housing in the confusing and brutal New York real estate market. Separately. Their separation is temporary, though. At least that's what everyone says. If you have seen Leo McCarey's 1937 "Make Way For Tomorrow" (a film Orson Welles declared "the saddest movie I have ever seen") then this set-up will sound familiar. In some respects "Love Is Strange" could be considered an unofficial remake. It has the same bittersweet heart, and the same almost urgent desire or demand that older people be treated with more respect. The couple in "Make Way For Tomorrow" are split up for similar real estate-related reasons, have to bunk with their busy adult children, and find themselves disoriented in a lonely world without their partner. "Poor Richard" (aka Ben Franklin) observed in his Almanack centuries ago that "Fish and visitors stink after three days." The people in "Love Is Strange" who take in Ben and George experience that upsetting truth. Ben crashes with his nephew Elliott (Darren E. Burrows), an busy video producer who is rarely home, and his wife, Kate (Marisa Tomei), a novelist struggling with her next book. They have an awkward teenage son named Joey (Charlie Tahan) who only has one friend, a swaggering Russian kid named Vlad (Eric Tabach). Ben is removed from his familiar environment, his partner and his cherished routines, and starts to deteriorate. George has a little bit more emotional resilience, but he begins to fall apart too, staying with a much-younger gay couple (Cheyenne Jackson and Manny Perez) who both work for the NYPD. George tries to sleep on the couch in a party house atmosphere, with "Game of Thrones" marathons and people coming and going. John Lithgow and Alfred Molina seem so comfortable in their roles that you have no doubt these men have been together for half of their lives. They capture the ease of such a relationship, but also the irritability, the telepathic quick looks, and then the sudden swoons of intimacy (especially when the going gets rough). Sachs and Zacharias have a great ear for the different rhythms of speech. Joey's youthful desire for privacy and boundaries is so acute that his language often seems frightened; he does not know how to assert himself, and he feels overrun. Ben tends toward melancholy; his words are contemplative riffs on whatever comes into his head. Kate is self-absorbed and stressed but doing the best she can in the void left by her absent husband. George, shut out of the Catholic Church that he still loves, tries to be practical and positive despite great pain. "Love Is Strange" is not showily directed, and yet there are touches throughout that help ground us in the characters' inner lives. George coaches a young music student on her "interpretation" of Chopin (Chopin's music fills the soundtrack), and as she tries the piece again, the music intensifies his personal drama, and he's so overcome that he has to turn away to hide his tears. Joey stands on the landing of an apartment stairwell clutching a skateboard, crying by himself. Beyond the window is the green of the courtyard. The camera does not move; neither does the boy. He just stands there, crying for as long as he feels like crying, then getting himself together and continuing on down the stairs. It's a caesura, potent and powerful, unhurried and true. By that point in the story, we need it as badly as Joey does. In movies it's the details that often bring transcendence—everyday moments illuminated by profundity or grace. Filmmakers discover them by observing how people listen to one another, the way they talk and touch, the pauses that settle unexpectedly between them, the silent private moments. It's a courageous film that's willing to sit in those moments instead of underlining them or hurrying past them, hoping we get the shorthand. "Love is Strange" is a patient film. The emotions it unleashes are enormous.